Welcome to the “Orda Cave” project! Orda Cave is the most extensive underwater cave in Russia, the second in Eurasia, with regards to length, and the world’s greatest gypsum cave. It has status of All-Russia natural monument. It is the first and the world only underwater gypsum excursion cave, member of I.S.C.A (Association of Excursion Caves of the World). In 2008 Orda cave was applied to be included in the List of UNESCO World Natural Heritage. Unique beauty of Orda cave was marked by the world-famous British cave-diver, cave-diving instructor of the Royal court of Great Britain and Martyn Farr. Initiators of the project: Vitya Lyagushkin, famous underwater photographer, journalist and dive-instructor, and Bogdana Vashchenko, diving journalist. The leaders of the project possess unique photo-collection, with regards to high quality and numbers of pictures, that resulted from numerous expeditions to Orda Cave. 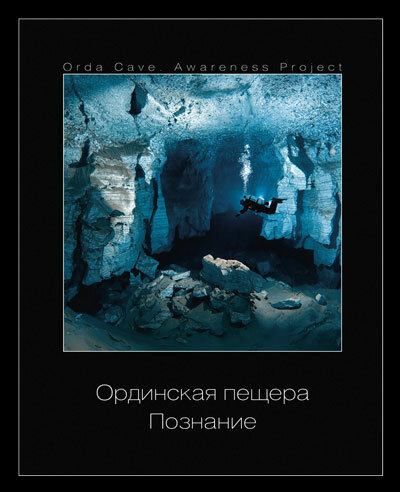 Project includes publication of photo-album, dedicated to Orda Cave (size 235х275 mm, full color, hard cover, 160 pages, circulation 3,000 issues, with Russian and English text). Besides pictures, the book contains interesting articles: Orda Cave origin and history, discovery of the cave, ITW’s with the cave pioneers. The technique of cave diving and tech-diving education are also discussed. Famous cave-divers, who did Orda Cave: Lamar Hires, Pascal Bernabe, Reggie Ross – shared their personal experience. Album price: is already sold. We are working on second edition of the book, this time in English, digital version for Ipad. Will be available soon!